Yesterday the temperature was in the 70s. This afternoon? 31 very damp, chilly degrees. I know it’s November, but I was really enjoying the warm sunshine! Steak Soup – Kansas City Style! Since the temperature isn’t working in my favor, it seemed like a good day to make a pot of soup. Plaza III The Steakhouse in Kansas City is known for their Steak Soup. When the natives talk about steak soup, it’s this one. This copycat recipe from my friend Jennifer’s family cookbook is delicious and perfect for a chilly day! The recipe makes about a gallon of soup, so if you don’t have a big family or a party of people to feed, freeze some or share with friends! The soup is surprisingly simple and uses few ingredients. The original recipe calls for Accent but I don’t use it because it contains – or is – MSG, which makes me wheeze. Instead, I substituted some salt and burger seasoning to add richness. It’s easy to see why this is a Kansas City favorite! This recipe makes about a gallon of soup so make sure you are using a BIG stock pot! If you don’t want that much, the recipe should halve easily. 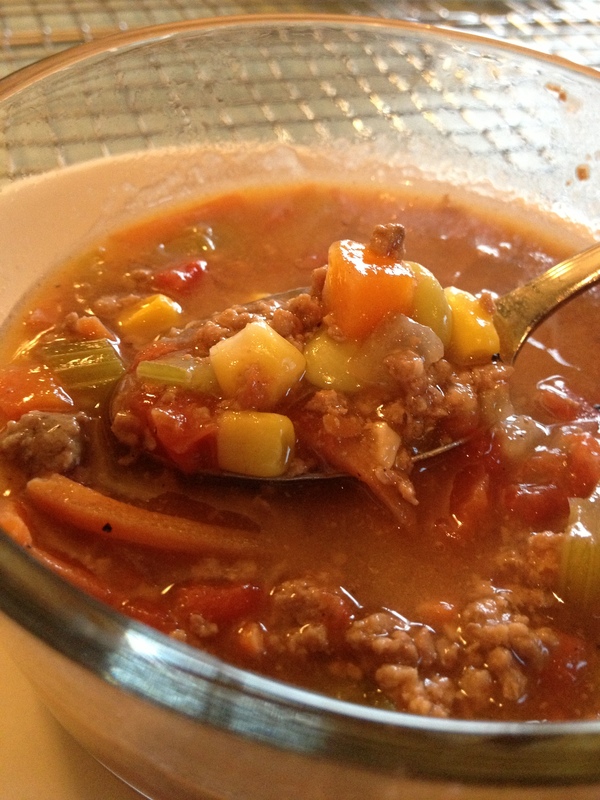 Put the ground beef, chopped onion, celery and carrots in large stock pot and cook until beef is browned. Drain off fat and transfer beef and veggie mixture to bowl. Set aside. Melt margarine in stock pot then stir in flour to make a paste. Cook for 2 minutes. Add in the beef concentrate and stir to mix. Simmer for 45 minutes or until veggies are tender. I’m glad you like it! It’s one of my favorites. I live in KC and have always loved this soup. I had the recipe but now can’t find it so looked this one up. It looks the same except mine called for Veg-All which is no problem but mine also called for Kitchen Bouquet to get the color you have. Mine is a cream color. How did you get the rich brown color. I’m so sorry for the late reply! I think the dark color comes from the beef base. I usually stir it into the meat before I add the water. Maybe it browns a little bit more? I’m really not sure!